We’d like to thank everyone who contributed to the Christmas food collection for Penny Dinners. The response was fantastic this year. 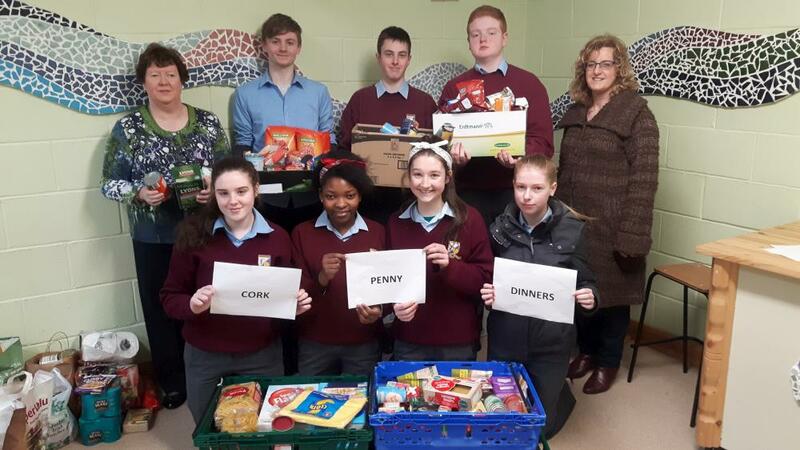 The Millstreet Community School Transition Year Young SVP group would like to express their thanks to all those who contributed items to their collection in aid of Cork Penny Dinners. 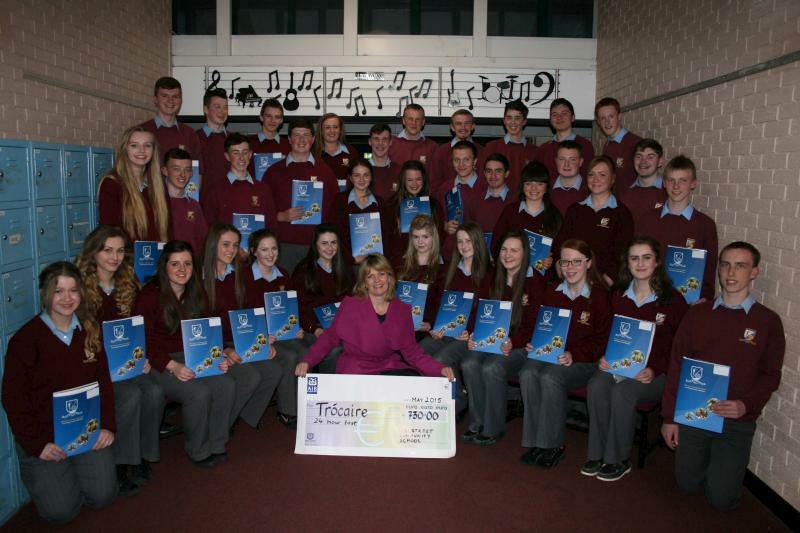 Aida Costello came to the school on Tuesday 20th December and some of the TY students involved, with their teacher Mrs Mary Randles, helped bring the substantial quantity of items donated to her car. The students would like to express their thanks for your support. A huge thank you to all who contributed to the food collection for Penny Dinners in the Community School. The response was stunning. We’d also like to thank Mrs. Randles and the TYs who facilitated. Millstreet Community School: Transition Year Young SVP group are organising a collection for Cork Penny Dinners. The aim of Cork Penny Dinners is to give everyone who calls to the centre in Cork a warm, nourishing midday meal. In addition, clients get sandwiches and fruit to take away as an evening meal. It is open seven days a week all year, including Christmas Day. Students are collecting the following items: tinned foods, orange squash, Easy-Singles cheese, sugar, tea, coffee, biscuits, salt, tea-towels, cleaning products. 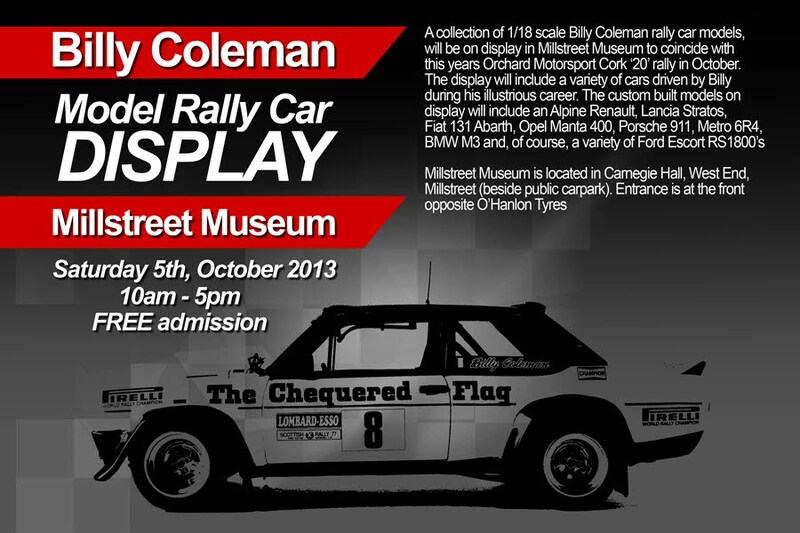 This collection will run until Friday 16th December. We are doing a food collection in aid of Penny Dinners again this year. Guys & Dolls Hair Salon and Coleman’s Centra have very kindly agreed to facilitate our collection again and donation boxes are in place in their premises. The aim of Cork Penny Dinners is to give everyone who calls to their Centre a hot nourishing midday meal. In addition, clients get sandwiches and fruit to take away as an evening meal. Penny Dinners is open 7 days a week all year, including Christmas Day. Any local businesses wishing to donate or get involved can contact 087 6886725. Anna, Stephen & Aida Costello. ITEMS NEEDED: Tinned Foods, Orange Squash, Easi-singles Cheese, Sugar, Coffee, Tea, Biscuits, Salt, Tea Towels, Cleaning Products. 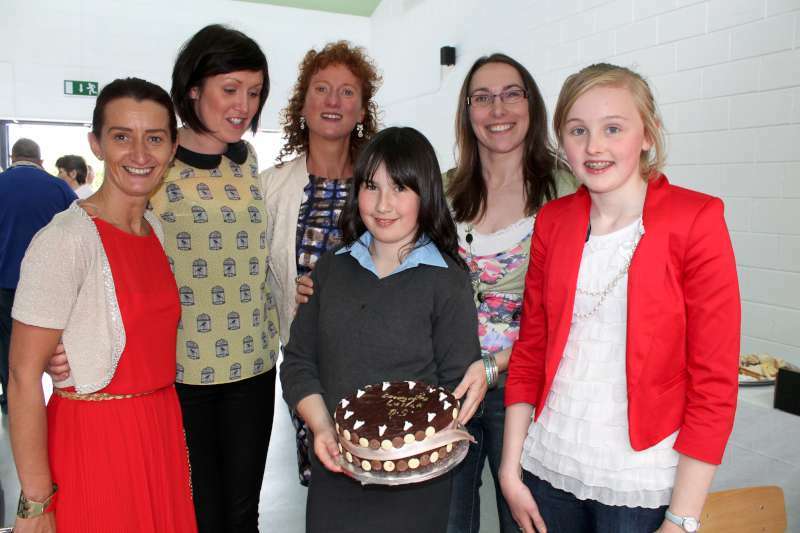 Some of you may have seen the programme on the Higher Hopes choir which was repeated on RTE last week. Never ones to rest on their laurels, our friends in Cork Penny Dinners have now started music lessons as an outlet for their clients and are looking for musical instruments in good condition. They are particularly interested in guitars, violins, keyboards, flutes, drums, amps, mics. 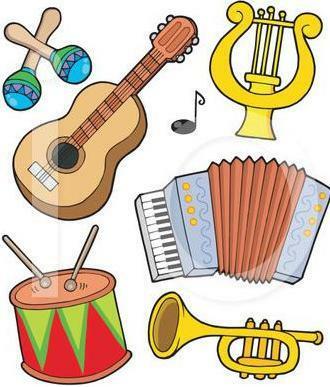 If you have any of these musical instruments, in good condition, which you are no longer using and would like to donate, please contact Aida Costello on 087 6886725. 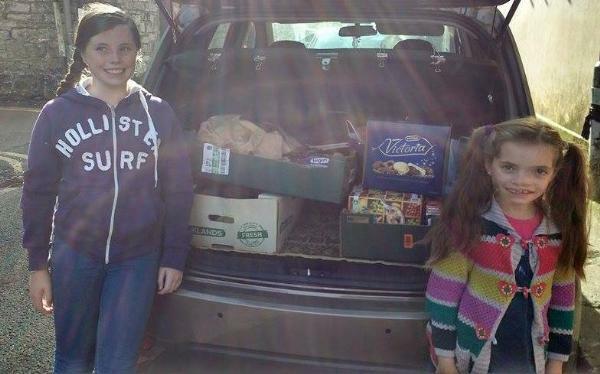 A big thank you to everyone who contributed to the food collection for Cork Penny Dinners. This time last year, Penny Dinners was serving 1,000 meals per week. By the end of 2015, they were serving 1,800 per week from a dilapidated and sub standard premises. Francis and John Brennan of At Your Service took on the challenge of giving the Penny Dinners premises a much needed makeover and the results were broadcast on RTE 1 on Christmas Day. This episode is still available on RTE Player (here). Christmas is over but the need is as great as ever, especially in the harsh weather conditions we are experiencing at the moment. Food collection boxes are still in place in Guys & Dolls Hair Salon, Coleman’s Centra and SuperValu. Thanks to Mary Murphy; Mary & John Coleman and staff; Joe Fitzgerald and staff for their continued support. Any other local businesses wishing to donate or get involved can contact 087 6886725. Thank you for your support, Anna, Stephen & Aida Costello. We are doing a food collection in aid of Penny Dinners again this year. We got a fantastic response last Xmas so we are hoping to repeat that success this year. Guys & Dolls Hair Salon, Coleman’s Centra and SuperValu have very kindly agreed to facilitate our collection again and donation boxes are in place in their premises. Any local businesses wishing to donate or get involved can contact 087 6886725. Anna, Stephen & Aida Costello. Cork Penny Dinners are looking for warm winter clothes for men, women and children of all ages. Blankets etc. are also required. Many of us have items at home that we no longer use. Donate them and spread the warmth this festive season. Millstreet Parent & Toddler Group will be a collection point for the next two Tuesdays. You may drop your unwanted WINTER clothing into the GAA Hall from 9.45-12.45 on Tue 24th Nov and Tue 1st Dec. Thank you all in advance. The staff of Penny Dinners have asked us to pass on their thanks to everyone in Millstreet who has contributed so generously to Anna’s Collection for Penny Dinners. We have been absolutely stunned by people’s generosity. The amount collected so far, particularly over the Christmas period, has completely surpassed our expectations. 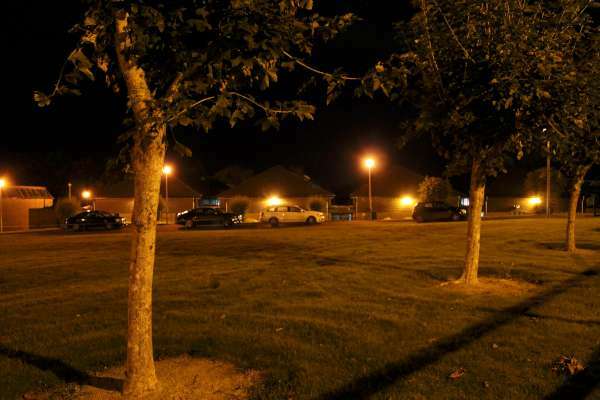 It makes us very proud of our little town. Thanks to the customers of Guy & Dolls, Colemans Centra and SuperValu. A big thank you to the staff, pupils and parents of Millstreet Community School who donated a staggering volume of goods. 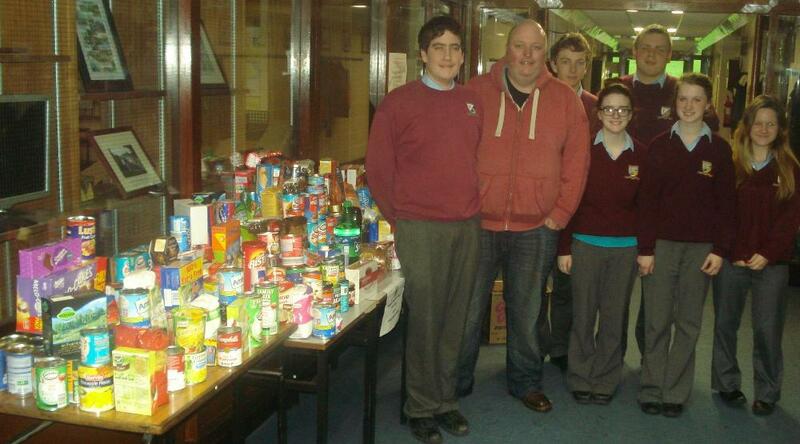 The photo shows Stephen and some of the Transition Years with just a small portion of what was collected. Mary Murphy of Guys & Dolls • Mary & John Coleman and the staff of Coleman’s Centra • Joe Fitzgerald and the staff of SuperValu • Gerard Ryan of Millstreet Community School • TY students Millstreet Community School • Michelle O’Keeffe • Donagh Reardon. 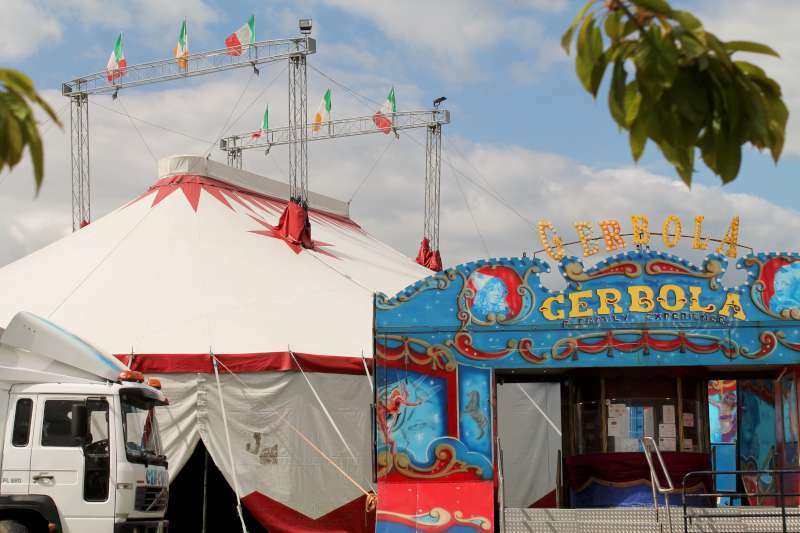 Collection boxes are still in place in Colemans Centra, SuperValu and Guys & Dolls. 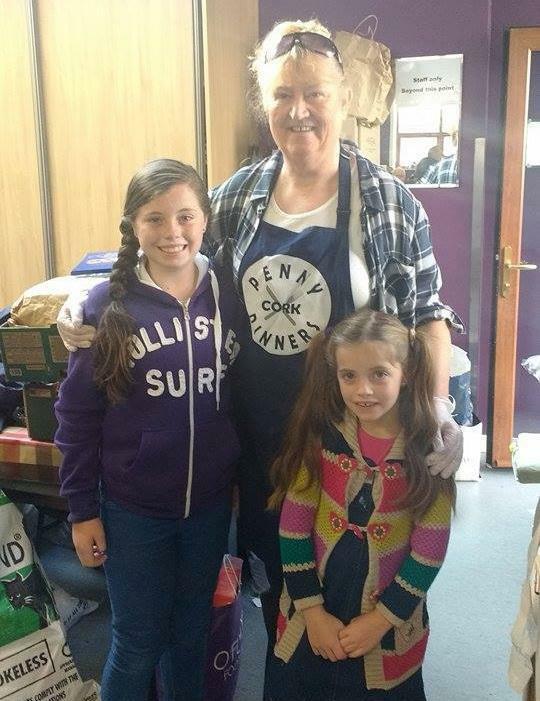 Sincere thanks to everyone who has contributed to Anna’s Food Collection for Penny Dinners. We are delighted with the response. We delivered another bootload on Saturday and the staff at the centre were amazed at the volume of food that we had for them. Their premises is tiny so storage is very limited but they assured me that they would make room for everything. We will be able to do another delivery this week thanks to the generosity of all in Millstreet Community School. Two years ago, Cork Penny Dinners was serving approx. 150 meals per week. It now provides over 1000 meals per week so all donations are greatly appreciated. Food collection boxes are in place in Guys & Dolls Hair Salon, Coleman’s Centra, SuperValu and Millstreet Community School. Please keep giving. We will continue to deliver the food as long as the collection boxes are filling up. Many thanks to Mary Murphy of Guys & Dolls, Mary & John Coleman and the staff of Coleman’s Centra, Joe Fitzgerald and the staff of SuperValu and Gerard Ryan of MCS for facilitating this collection. Any local businesses wishing to donate or get involved can contact 087 6886725. Update 10th Nov: Aida has been in contact with us to tell us that another collection box is in place in Guys & Dolls Hair Salon. 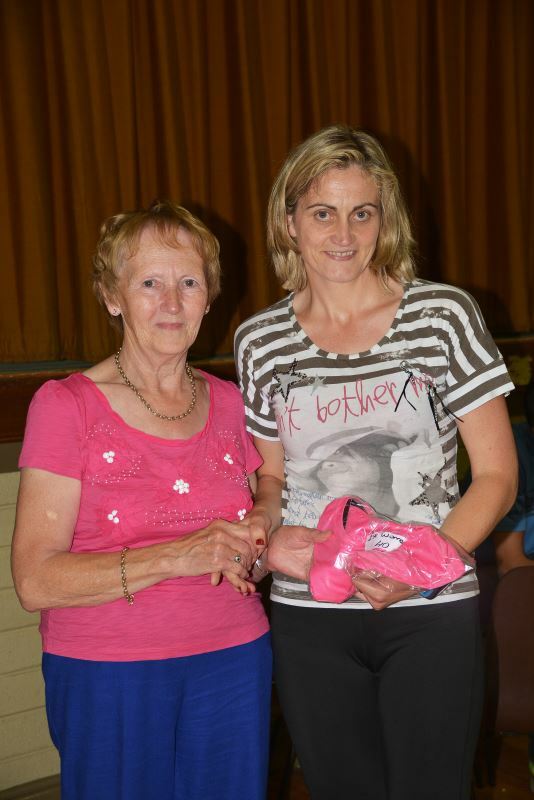 Thanks to Mary Murphy, proprietor for her support. My name is Anna Costello. 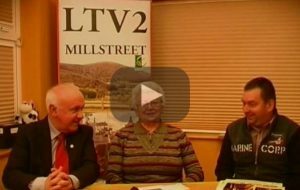 I live in Millstreet and volunteer in Cork Penny Dinners every week. Cork Penny Dinners is a fantastic service that currently provides over 1000 meals per week and relies completely on donations. I am doing a food collection in aid of Cork Penny Dinners. I would really appreciate if anyone would like to donate by putting any of the food items below in the boxes provided in Coleman’s Centra and SuperValu. Many thanks to Mary & John Coleman and the staff of Coleman’s Centra and to Joe Fitzgerald and the staff of SuperValu for facilitating this collection. Any local businesses wishing to donate or get involved can contact 087 6886725. Thanks for your support!